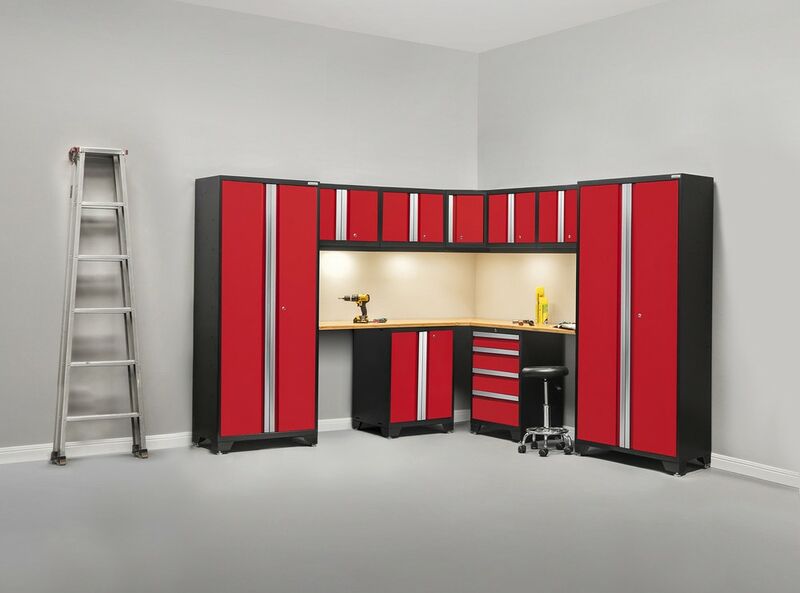 A great addition to your garage or workshop, the Bold Series Cabinet Set features welded frames made of 24-Gauge steel double wall reinforcements on doors. The redesigned full length easy grab handles on the fully lockable doors offer a great modern look for any garage. The cabinets come with adjustable legs to keep cabinet’s level or you may choose to mount the cabinets on the wall or even or castors. Wall Cabinets come with an optional light valance for hiding unsightly wires for under mounted LED lighting kits (sold separately). Worktops are 1 in. thick and are available in stainless steel with a solid wood core or solid bamboo. Integrated cable access holes in the locker and base cabinets for an easy way to charge your tools and valuables behind locked doors. Each cabinet arrives to your home fully-welded for easy installation, just add legs (optional) and position. Because every work and storage space is unique; our cabinets feature fully-adjustable leveling legs and perforated back-panels for easy positioning and wall-mounting. Bold series multi-use lockers hold up to 800 lbs; base and tool cabinets hold up to 600 lbs; and wall cabinet holds up to 100 lbs.